Top Chef countdown. Tonight at 9. Bravo for Seattle chefs. Need a little preview of tonight’s Top Chef Season Six premiere, starring Seattle chefs Robin Leventhal and Ashley Merriman? Well, this video-tease promises blood and guts, tattoos, cleavage, bleeped out swearing and a few chuckles with Wolfgang Puck. My pal Rebekah Denn caught up with the local talent this morning, and interviewed the two about living la vida loca Top Chef-style in Las Vegas. 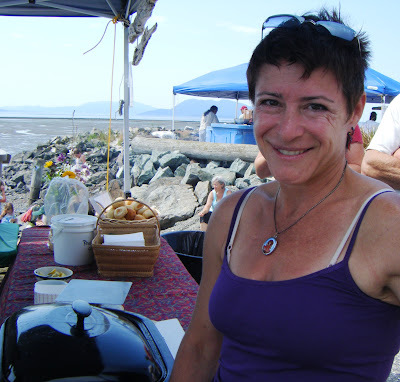 Meanwhile, I caught up with Robin late last month when I ran into her at the Samish Bay Bivalve Bash in Bow. There, she shared her steamed clams but clammed up regarding whether she — or Ashley — lived to see the second episode of Bravo’s hot chef show. Robin, hold the makeup, waiting for her steamed clams at the Bivalve Bash in July. But really, who cares about being a star on television when you’re already a star in shellavision? Robin must like competing. 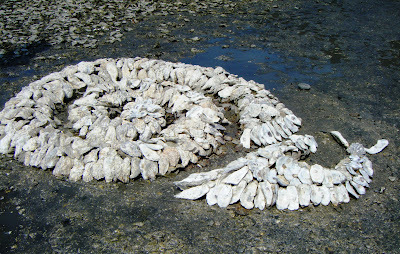 She showed up early at the Bivalve Bash to work on her oyster-shell sculpture “Slow Tide” (get it?). And since no one put a gag-order on me, I’m here to tell you right now: “Slow Tide” didn’t win the dough in Bow. As for Top Chef? You’ll just have to watch tonight at 9 to find out.